There is a long, rich tradition of fine artists making a transition into filmmaking. It is, after all, just another medium for expression- and a primarily visual one at that. American painter Julian Schnabel made the jump with his excellent 1996 biographical drama Basquiat, before moving on to acclaimed films like Before Night Falls and The Diving Bell and the Butterfly. Photographer Sam Taylor Wood kicked off with a biopic as well: 2009’s Nowhere Boy, about the young John Lennon. Steve McQueen directed Hunter and Shame before hitting the Hollywood big time with the 2013 drama 12 Years a Slave. Jump back a few decades and you’ll hit Andy Warhol, and in another few you encounter Jean Cocteau. Some of these artists-turned-directors do better in their new medium than others, but usually they are at the very minimum able to make interesting films. One of the most recent to make the attempt is Japanese artist Takashi Murakami. He is famous for his so-called ‘superflat’ art style, and his canny blend of ultra-commercial elements, anime, Japanese popular culture and traditional art. His work is extraordinarily commercial, selling associate merchandise and mass-produced copies by the truckload. He is, in that respect, a particularly strong candidate to make the jump to directing his own commercial feature film. This he did, in 2013, when he wrote, produced and co-directed (with horror filmmaker Yoshihiro Nishimura) the film Jellyfish Eyes. Masashi (Takuto Sueoka) has moved to a new town with his mother. While wandering around near his house he discovers a strange jellyfish-like creature that floats through the air and has a craving for the manufactured cheese and fish sticks that Masashi likes to snack on. When he goes to school, Masashi discovers that all of his classmates have creatures of their own – dubbed Friends. The creatures’ existence seems due to activities at a nearby research facility run by Masashi’s uncle Naoto (Takumi Saitoh) – and infiltrated by a quartet of evil teenagers dressed in shiny black cloaks. The reductive manner in which one describes Jellyfish Eyes would be “E.T. meets Pokemon“, since it has the fatherless boy meets friendly alien storyline of the former, and the masses of pit-fighting fantasy creatures of the latter. 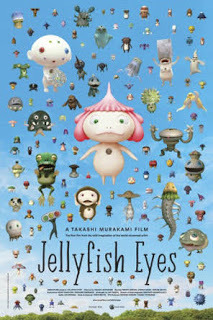 The influence of Steven Spielberg’s 1980s work is clear in Jellyfish Eyes, although Murakami fails to deliver the emotional clarity and affect that Spielberg mastered. The influence of Pokemon feels more like an excuse: it’s an easy hook to draw in a mainstream Japanese audience, and the 100 plus cartoon animals give Murakami plenty of scope to design and illustrate in a manner akin to his regular art works. The film escapes from its relatively small production budget by deliberately rendering the Friends in non-realist ways. They are smooth and simply designed, with faces and limbs that are for the most part sparsely featured. They do not for a second look real, because the story Murakami is telling does not require them to. One friend, a large furry Sendak-esque beast owned by Masashi’s friend Saki (Himeka Asami), is presented as a man in a large furry suit. The design of the Friends is a highlight of the production and, I suspect, the main reason why people will seek this film out and enjoy it. Technically the film is well put together, with a bright colour palette. The acting is decent enough without any single actor standing out or making a significant impression. The storyline is to be honest rather perfunctory. It is genuinely strange to see its English subtitled release come via Janus Film’s Criterion Collection, which usually reserves itself for demonstrated high quality works. I did enjoy Jellyfish Eyes, but it really is well below the standard that label typically sets for itself. So watch it at all? For one thing it is still a reasonably pleasant children’s film with a decidedly Japanese edge. For another it has an oddly dark edge to it. It has some content that likely doesn’t belong in a children’s movie, including enough violence to draw blood, and an apparent suicide. ident. It is a remarkably bold choice for Murakami to make in his story, coming just two years after the Tohoku earthquake of March 2011. Later scenes in the film reveal Saki’s parents to be members of an apocalyptic cult. Such cults are disturbingly commonplace in Japan, with the country still haunted by the 1995 Tokyo subway gas attacks undertaken by one particularly appalling cult. The inclusion of these elements, and the deep mistrust expressed by many adult characters towards the Japanese government, give the film a particularly dark and very Japanese tone. It feels mildly transgressive: these are not the sorts of subject matter one expects to find in a breezy children’s adventure film. Scenes of school bullying also have a slightly appalling edge to them, with students suffering real physical injuries in addition to psychological ones. I am not certain this is a particularly great film, but it is certainly an interesting one. The Friends designs alone are probably watch giving it a look. A post-credits scene promises a sequel that, to be honest, looks a lot more interesting with a harder science fiction edge to it. Sadly the poor public response to Jellyfish Eyes in Japan has likely consigned that potential follow-up to the rubbish bin. This review was originally published at The Angriest on 30 December 2015.